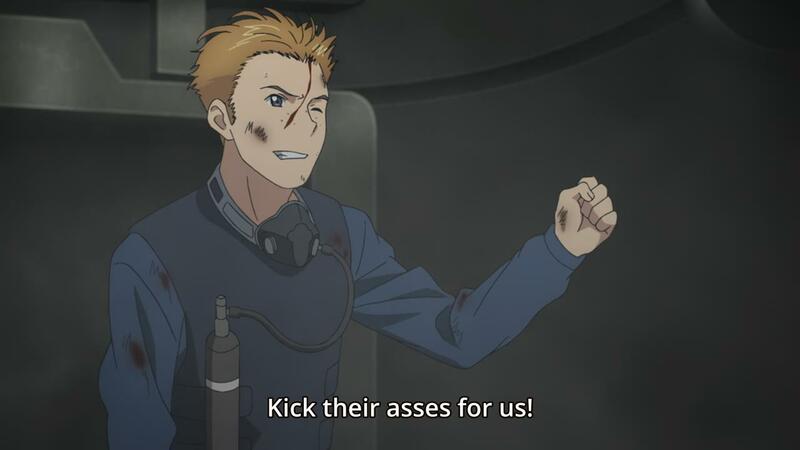 Aldnoah.Zero episode 12 (Finale) – “Everybody, Do the Combination!” / Reaching, and Failing « Geekorner-Geekulture. So, the finale of the first-cour is upon us, and the second-cour was double-confirmed to begin airing in January 2015. The director or author of this show promised us this episode will end in a massive cliffhanger, but really, was such a promise necessary? Considering about 70% of the episodes ended in a cliffhanger or a twist (episodes 1, 3, 5, 6, 7, 8, 9, 11, and the rest ended on “Cool!” moments), it was sort of given that the finale of the first half would end on one as well. So, we’re having a face-off, between humanity’s greatest hope (Inaho in the orange corner!) against the tragic and ironic Martian Rebel Leader (Count Saazbaum in the red corner! ), and everyone else is just trying to survive. This is a fight for humanity, and for the survival of mankind, and justice. Slaine keeps running around, always late to help people. So, if we want the episode to end on a suitably ironic and “ZOMG!” moment, we probably need something like Asseylum shooting Slaine, or better yet, Slaine shooting Asseylum, while he tries to shoot Inaho, or just join Saazbaum in order to backstab him in the second half. Let’s see how it goes. Write-up incoming. Edit: Here’s a webm of the combination. It’s friggin’ 62 seconds long. Pomf.se is down, will reupload there later. 1) “The Deucalion? Why is it here? !” – The nightmare of those on the advance forces, who risk their lives in order to keep everyone back safe – to find out the rear had been made a front of its own. 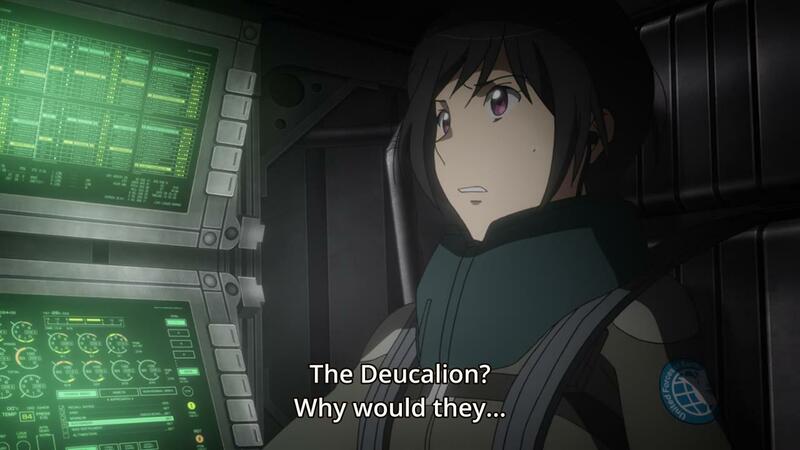 But if you think about it, that’s sort of a recurring theme in this show thus far, about how they’ve had to keep fighting on board the refugee-filled ship, about how their civilian homes had been destroyed immediately after they managed to escape. All of Earth is a front. 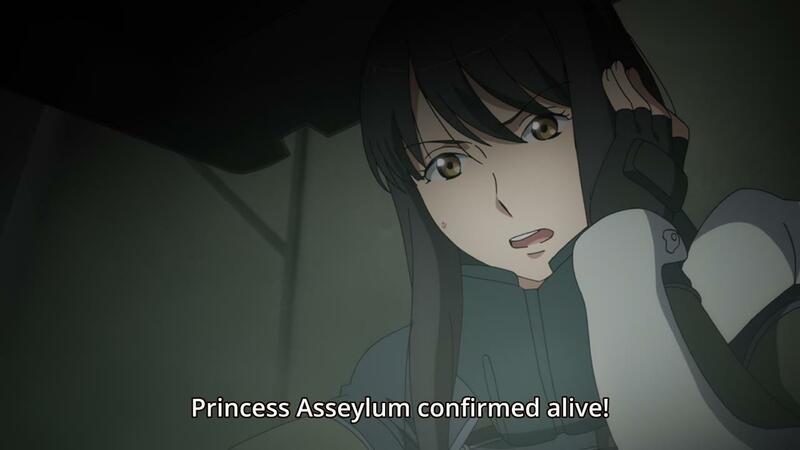 2) “Princess Asseylum confirmed alive!” – Yes, yesss, keep shouting over your communication system how the Princess is alive, so the opponents with their superior technology could hear it. I’m beginning to suspect a mini-twist is that this is Rayet using Asseylum’s “Appearance-switching” gizmo as a decoy, and that the real Princess is elsewhere. I hope they do that, the alternative is pretty stupid. 3) Inko with her tearful determination, Inaho with his poker-face. Well, he didn’t reply at the “Kaizuka the younger brother”, so there’s that, I guess. And Calm, still with his “Kick their asses!” Hollywood character attitude. 1) “Wars are a form of negotiation between countries, and erupt even when there is no hatred. They end when the nations’ objectives are met.” – Inaho’s right here, but Count Saazbaum actually has the other side of this conversation covered, especially since Inaho’s little talk makes less sense when you speak of “Pride and ideologies”. Religion was a good example. What do I mean? As Saazbaum said, even if the objectives are sensible and don’t involve hatred, hatred is then stirred up, emotions are manipulated, in order to convince the population to go to war, and that war is a good decision. You paint the other side as “less”, less than us, less than human, to justify the war. The original reasoning might not have had hatred, but by the time the war erupts, it’s often there, and certainly by the time the hostilities end. How are your objectives regarding “pride” or “ideology” met? And finally, how do you separate the side from its leader? The Martians want Earth’s resources, Saazbaum seems to want recompense for a dead lover, meaning revenge. That’s too close to hatred to separate it, in terms of outcomes. 2) Ha! Actually using Inaho’s rationality for something in this series in a good way! “Hatred and anger are ways to tilt the war favour” (meaning demagoguery), “I don’t care for these emotions, so I wouldn’t hate anyone just for belonging to the other side.” That was actually a pretty neat use of the established character. 3) Ah-ha! Saazbaum shows them he can hear their comm systems! You’d think he’d shoot first, and gloat later. That was such a James Bond villains moment. Also, it shows you he actively hated the Terrans. Is it because he was manipulated by the Vers family? Is it because he’s jealous of them? It doesn’t really matter, even if it’s not 100% sensible. People, Inaho aside, aren’t 100% rational, and what matters is Saazbaum hates them, and that’ll dictate his goals and behaviour. Mocking Martian, Take 500. Coupled with “honour”, which Marito told us is useless. 1) The Orange trainer Kataphrakt, against Saazbaum! In Inaho we trust…. I guess he’s the OP MC. I wish Saazbaum just ignores him and walks past, but declaring his name, tapping into the communication system before attacking? Alongside freeing Slaine, it’s clear he works by a certain code of honour, so will fight Inaho off before moving past him. Honour demands! And Inaho knows it, “I don’t need to win, just buy you time.” You can have multiple goals. His goal is to get the castle shut down, not defeat Saazbaum, though that’d be nice. 2) Oh, Rayet is still fighting at the bowels of the Earth, guess she’s not there instead of Asseylum, and that’s the real Princess. But back to that point, will Rayet and Slaine join the party? They must. Inaho fighting Saazbaum was accompanied by pretty hopping music, I must say. And he’s combining all the powers Inaho defeated before, on their own – a plasma blade, the dimensional barrier… it’s how you construct a video game – you first face a new technology used by a boss, and then it appears by the grunts, or a boss mixes and matches all the strengths of all the other enemies. It’s the return of the flying fist! I guess it does have one narrative use as well, it reminds us of all the enemies that Inaho defeated up to this point. It’s also a sign of the Martians’ “You’re not fighting alone!” as Saazbaum carries his defeated allies’ will and honour on his back, against the one that took them down. 1) Poor Slaine, threatened by a Terran, saved by Martians, how will his honour handle it? This is warfare, and everyone’s just trying to make it out alive. 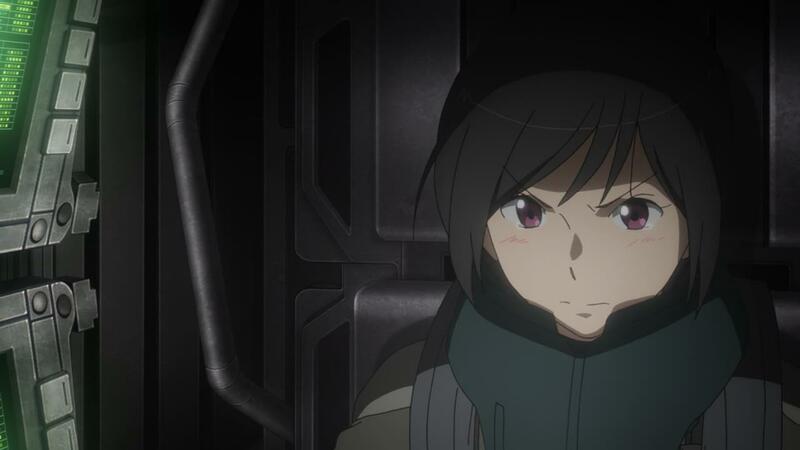 That soldier is using the same logic as Inaho when he talked to Rayet, “I’m saving the one who aimed a gun at my enemies.” – Sides aren’t decided by birth, but based on who you’re fighting, eh? Hatred based on race is merely foolish. That’s the show’s message here. And now that voice of reason is killed, by a Terran, by war. What’s a poor boy like Slaine to do? All he wants is to reunite with Asseylum. 2) And that’s the other use of using powers Inaho encountered before. Previously, all that technical chatter about how things worked often came too late, that it appeared to come after Inaho had already defeated his enemies, without proper foreshadowing or build-up, right? Well, that’s still true about those past instances,but it at least means that the logic behind what we see now was actually explained to us before this scene – the interaction of the fists’ thrusters with the shield, for instance. I guess hurray to small victories of storytelling like this one. 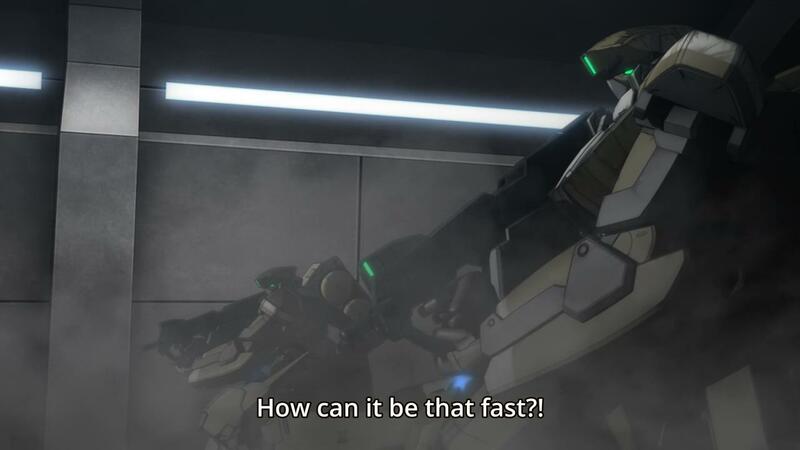 3) Why did Inaho fight Saazbaum, in melee? It doesn’t appear to make sense, right? Well, as he said, you need the war to stop by having the other side’s objections be met, so he’s letting Saazbaum vent. And if part of the fight is due to feeling and thinking that as Martians they are superior to Terrans, then he must disabuse him of that ideology, which means step down to his enemy, and still beat him. Still, not entirely sensible, another Hollywood moment. But Saazbaum at least is aware of the tension I raised before, his fight is with the Vers family, so why does he fight the Terrans? 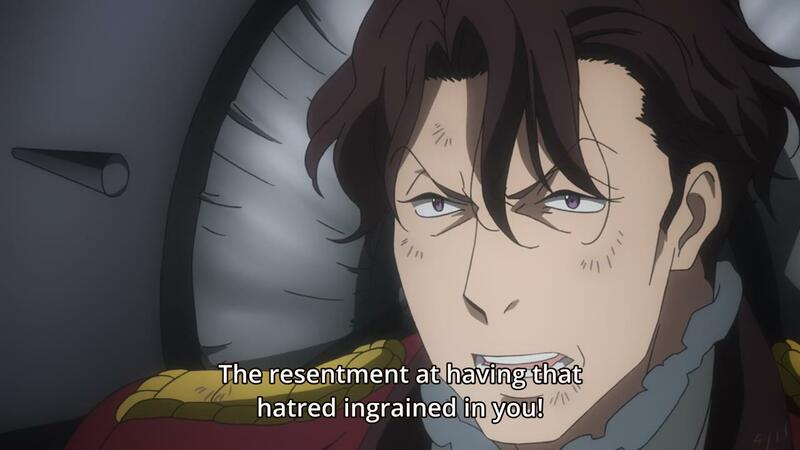 He hates the Vers family for ingraining hatred in him so deep that he can’t think of himself apart from it, that he must define himself by such a negative emotion, that he was made less-than-human in order to consider others so. But when all is said and done, he still hates the Terrans, because that’s what was done to him. It’s not their fault their life was so much easier than his, but it still was, and he’s still jealous. Sometimes it’s as simple as that, without need for “rationality”. 4) Cute callout to Suzaku via Slaine, in how he dodges all the bullets, moving so quickly, flying a white Kataphrakt, eh? 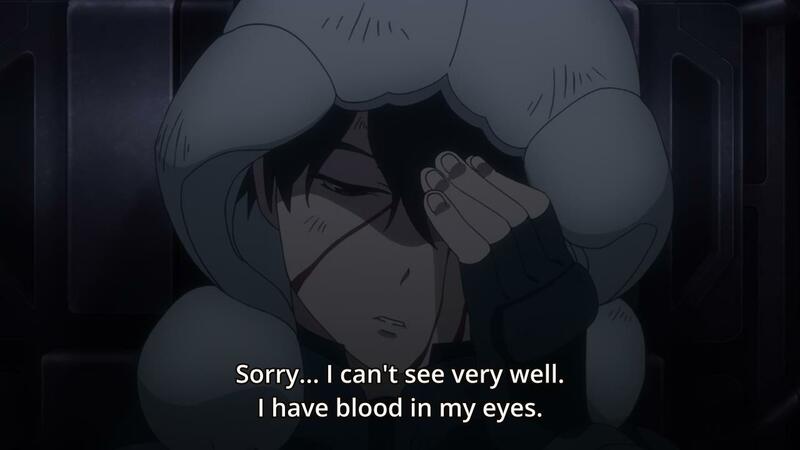 1) “I can’t see very well, I have blood in my eyes.” – All the symbolism of that sentence. Rage and bloodshed blinding us to the truth. 2) “You saved me, Slaine…” just after Saazbaum apparently kills Asseylum. IRONY! Yeah, this show can’t let go off of that pedal. Self-loathing, self-blame, Slaine’s ride never ends. 3) That was a very nice scene, technically. No music for the first part of it, then muted music later, just Inaho crawling towards Asseylum. And then they showed us his memories of her, his interactions with her, with a sad smile on his face. Did they try to sell us right here that he “loved” her? Come on, that so doesn’t work for this character. And even though this scene was so very well constructed, it left me entirely cold – you don’t expect us to get invested in Inaho’s “feelings”, right? Also, Asseylum survived episode 1, and last episode. Something tells me she’ll keep on surviving. 4) “The castle had fallen. The battle ended with victory for the United Earth Forces.” But why? Saazbaum fell, and yes, the castle has no more energy, but what of all the remaining Kataphrakts? It’s not like Earth really has anything to deal with them. “HE CAN SMILE!” Too late. Erm, this was certainly an episode. I didn’t have too many hopes for this finale, in part because the episodes leading up to now had been too heavy on padded fight scenes, cool Hollywood moments, and trying way too hard to have “Cool Twists™” to actually work on the story and characters, which episodes 8-9 made big work on. I didn’t expect much, but I hoped for the best. So, did this episode surprise me? Oh yes it did, but not in a good way. That combination came out of nowhere, and felt so out of touch with the more serious atmosphere the series tried to project. But then again, it fit perfectly into last episode’s atmosphere (“The Little Jeep that Could”, Hollywood action to the max). Though the combination at least took all of the series’ previously padded and not entirely well-explained fights and put them to good use, giving us a fight we could understand, and that was made sensible in advance. Saazbaum too made sense, except for his “I’ll break the circle of hatred” combined with his following behaviour. There were a lot of jambled messages in this episode that could’ve easily taken more time – what is the payoff to Slaine’s little chat with the soldier on sides? Is it about who you happen to be aligned with, or fighting for what you believe in? Is Asseylum dead? I doubt it. We didn’t see her head being shot, and we saw Slaine fly off with her, probably, as Yuki narrated her body not being recovered. Is Inaho dead? Well, his head was shot, but I really wouldn’t be surprised if he’s still alive. Either they open the first episode of next season with him being alive, or perhaps he’d make a “”shocking”” entry at some point, either as the episode ends, or around episode 3. I know many people won’t like what I’m about to say, but I hope Inaho actually stays dead. First, because I feel he kept dragging this show down, and the show and other characters would get considerably more time and agency with him gone, and their choices will matter more. And that’s the other bit of it – if you want us to believe the stakes in this series are real, then the dead have to stay dead. If actions and losses can simply be undone, what sort of message are you sending, and how do you expect us to get invested in the series? And honestly, Inaho crawling towards Asseylum’s “corpse” to me is the perfect summation of the series. 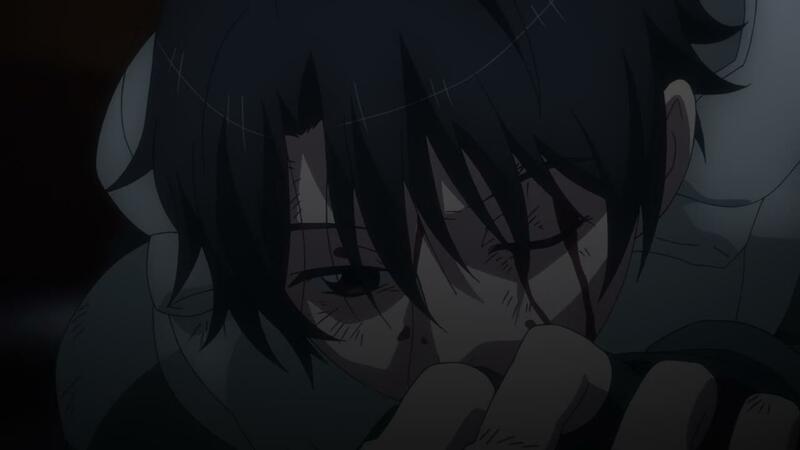 A superbly well-crafted sequence, and one where I wanted to feel the “feels”, but just one that felt hollow and empty because the characters didn’t ring true, and Inaho’s so-called feelings aren’t ones we can get invested in, so having your “emotional final” rest on his shoulders is just a bad call. I’m going to watch at least the first episode of the next season, just because I’m really intrigued by how it’d go. 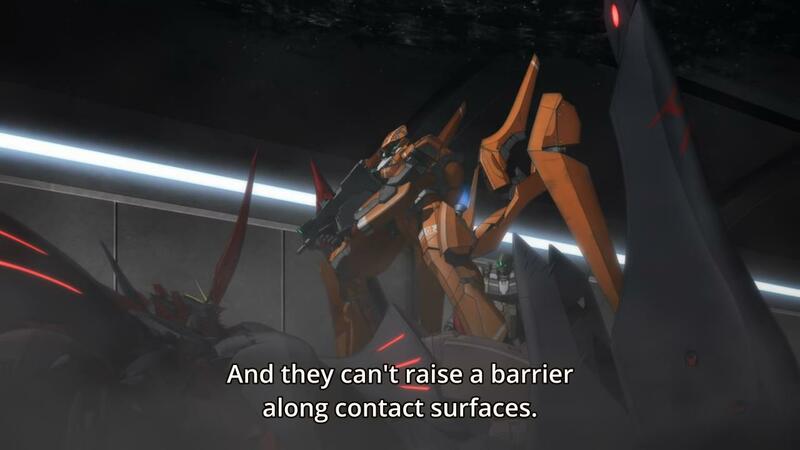 I sometimes said this series made me long back for Valvrave, especially for its first half, because it was just fun. 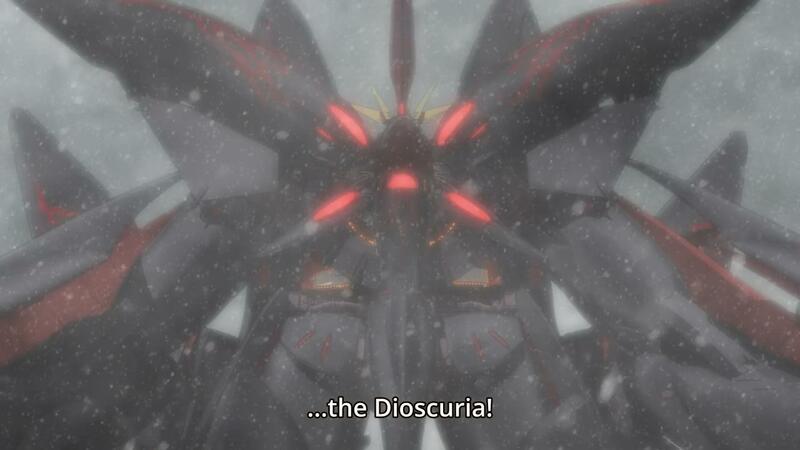 Well, this episode certainly was “fun” and “crazy” as people often say Valvrave was, but it felt so out of place. Ultimately, a disappointing season, and a very disappointing finale. I guess I should be thankful it literally made me laugh when the combination happened. I guess the more serious side of the combination is Inaho defeating the combined arms (literally) of the Martians. And then dying to another Terran. Return to the Aldnoah.Zero Episodic Notes page. This entry was posted in anime, Episodic Notes and tagged Aldnoah, Aldnoah.Zero, Pffffft. I hope the princess is dead. The “princess is secretly alive” trick has been pulled too many times. And although Inaho is certainly the best character we’ve seen so far, it would cheapen the entire show if he was still alive. He’s also a little too overpowered to survive. I’d be fine with the Princess being dead, though yes, that trick was pulled a few too many times. I’d be happy for Inaho to remain dead, though. And although Inaho is certainly the best character we’ve seen so far. Inaho is the character we’ve seen the most of, the character that seems to have had about 70% of the screen time, and had 90% of the agency. As such, it’s so baffling, and it’s so terrible that he’s not only not the best character in the series, but one of the worst. He not only didn’t do much, or get much development, he actively hurt the development of other characters on screen, and their agency. 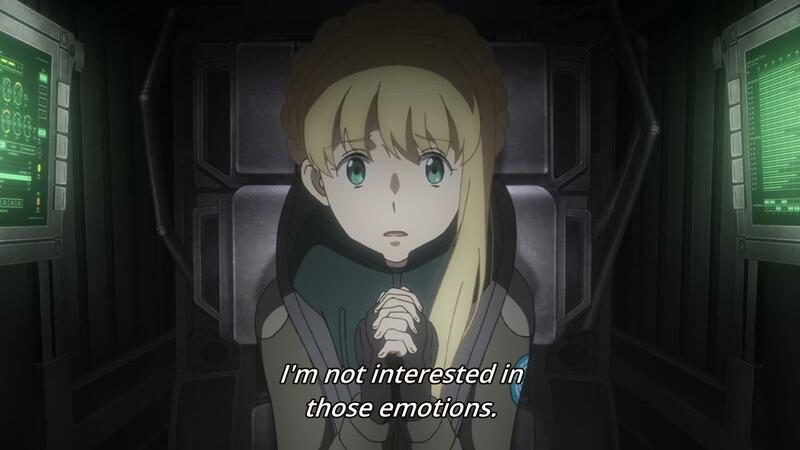 Inaho was a big stone weighing the series down, with him gone, all the other characters and character-arcs, Slaine, Rayet, Magbaredge and Marito, might even get some room to breathe. I have to agree. The development of Rayet, Magbaredge and Marito felt very rushed as we weren’t given much time to connect with these characters before the time came when we were supposed to feel for the characters (something that could have been solved by giving them more screen time). As a result, I felt very little, emotionally, when Rayet was pouting about Martians and Magbaredge about Marito. The whole exchange felt empty and shallow. I do wish we got to see more of Count Saazbaum, however. While his character ultimately was complete, I was and still am very curious as to what Saazbaum’s plan was after killing the princess. Suicide? Attempt the regicide of the Vers Emperor? Or continue his genocide of the Terrans? Shame he didn’t receive the privileges and protections of an MC :(. Yeah, Saazbaum was… missing some stuff. He got some scenes, and yet in the end his character’s logic, or even the lack of logic, was incomplete. 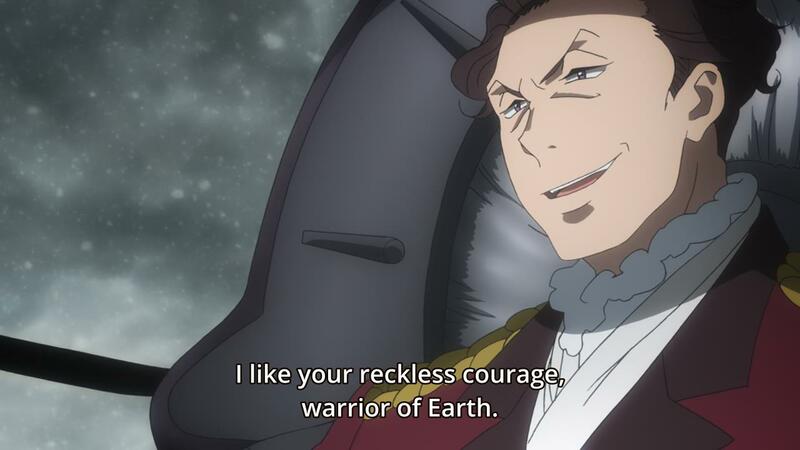 I feel that people on other media took the tack I mentioned above, which just shows more issues – Saazbaum is basically making Lelouch’s gambit at the end of Code Geass. But, he didn’t reason through it, there was no “What comes after”, so that line of “I’ll kill all those who hate” came out of nowhere, and even if he did, which includes killing all of his allies in this war as they all hate, what about the new hatreds that would arise as a result of this war? I suspect Rayet, Marito, etc. will be the main characters in the next season, or at least will play a big part. Yes, a lot of the changes would feel a bit “hollow” as they weren’t earned while they were on screen, but it wouldn’t be worse than being introduced to characters and outright told how they were pre-show. The question is whether we’d treat it as the second half of the same show, or a new show, and which would be better. I think the lack of development of Inaho’s character throughout the season kind of makes sense with this finale. Like you said, Slaine should have been a main character but he was always in the wrong place at the wrong time. As a result his actions didn’t affect the plot by much and was more used to explore the show’s themes (irony, irony) and the “enemy side’s” convictions (more irony). 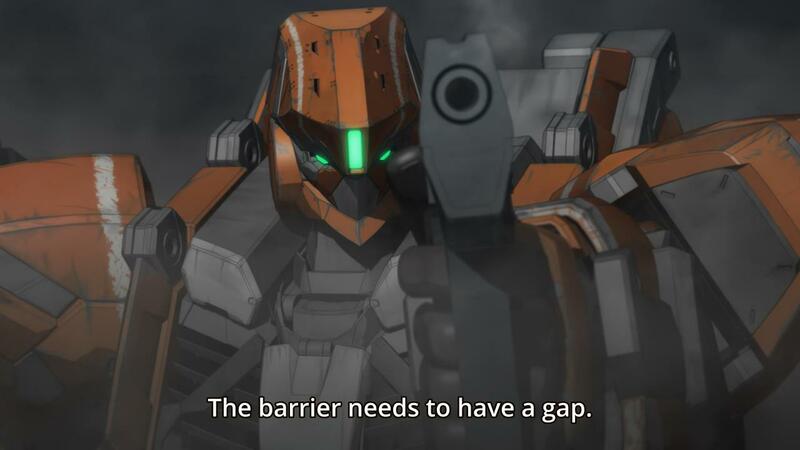 Well, to paraphrase Kaizuka Jr., every barrier needs to have a gap; every armour, a chink, and that chink ended up being the pseudo MC, Slaine. Now with Inaho dead and his beloved princess presumed dead, the 2nd half of the show will be able to focus on the already partially developed Slaine as the new MC. I’m actually very excited to see what Slaine will do in the 2nd cour and am disappointed to see that you weren’t :(. As for the doubted finality of the deaths of Inaho and the princess, l have every confidence in the writers of the show that they will make sure that they remain dead. With the passing of the MC torch to Slaine and the, in my opinion, emotional end of the 2 characters, it would be counter intuitive for them to make an appearance in the 2nd half. 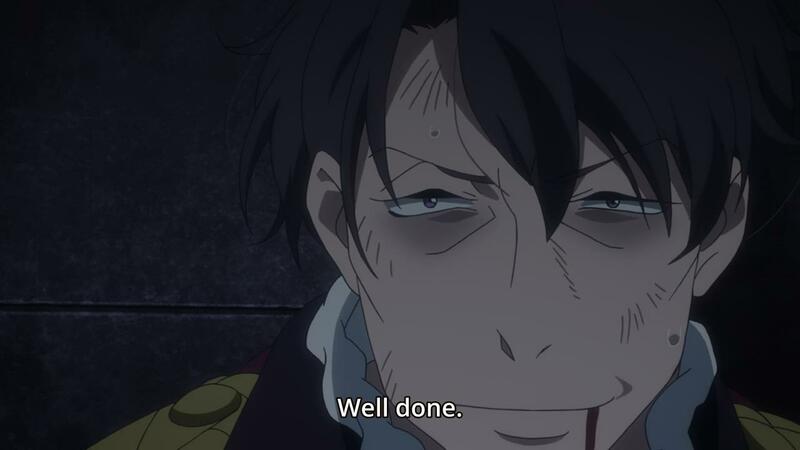 Also, (this may be my most flawed arguement but) if you look to the many other shows Gen Urobuchi has been involved in (Fate/Zero, Psycho pass, Madoka Magica), the concept of the finality of death is established in each show. While he may not have played the biggest role in the writing of Aldnoah, I still firmly believe that the writers will adhere to this concept and allow Inaho, Asseylum and the audience to rest in peace. I agree. This opens the show up for a much better second cour. If played right, the failings of the first cour will be irrelevant, if the second cour manages to focus on the conflict better, and give us more of the good characters. That’s a big if, but some loose ends have already been cut (Inaho and Asseylum), and it’s looking like Slaine is our new MC, which is a good thing. We’ll just have to see where it goes, but this ending did give me some hope. If played right, the failings of the first cour will be irrelevant, if the second cour manages to focus on the conflict better, and give us more of the good characters. Regardless of anything else, I can’t agree with this. It could be irrelevant to the second half, I agree. But poor episodes are poor episodes. Suppose you watch a great show with 2 terrible episodes. You can still give it 10/10, and say everything else made the experience as a whole worthwhile, but those two terrible episodes didn’t magically disappear, they were still terrible. I thought the finale was the worst episode. Though to be honest, if the series ended here, rather than knowing it’d have had another half? I’d actually think better of it. Your comment, and others I’ve seen, keep acting as if there’s one “main character”. But this isn’t a novel told entirely from a single character’s point of view. Officially, the show has several main characters. I mean, in most Gundam-esque shows we know that both of the “mirror-sides” are main characters, which would be Slaine and Inaho, in this instance. And that I even have to type it is part of the problem. The show officially has three main characters, and even just going according to the genre conventions, has two. But looking at what actually happened, Inaho’s deprotagonization field kept us from looking at anyone else as more than a two-bit player. Of course, that’s still looking at the show mostly from a plot-centric point of view. If we look at the series from a thematic point of view, it’s hard to argue against Slaine, or perhaps even Marito being main characters, right? Also, even if we look at it from a narrower perspective, the sort of outlook that goes “Only main characters should be developed, and secondary characters shouldn’t”, which is the point you’re making, though you’d probably like not to, leads to pretty shallow works quite often. Every character of consequence could benefit from being fleshed out. 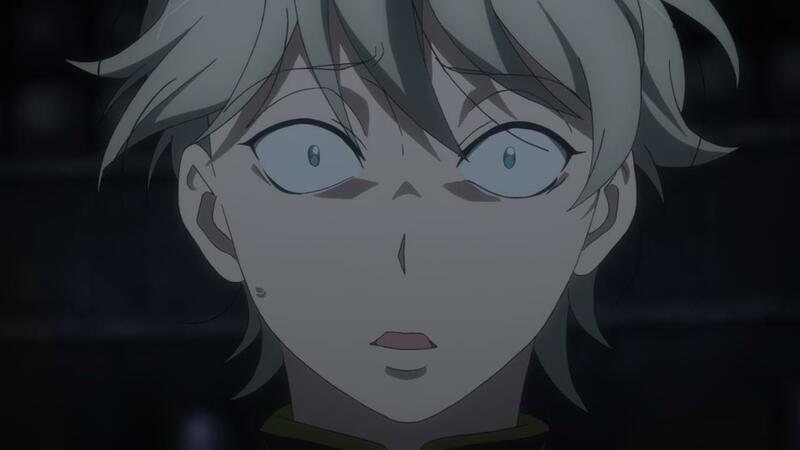 I’m actually very excited to see what Slaine will do in the 2nd cour and am disappointed to see that you weren’t :(. Well, there are two reasons for that. 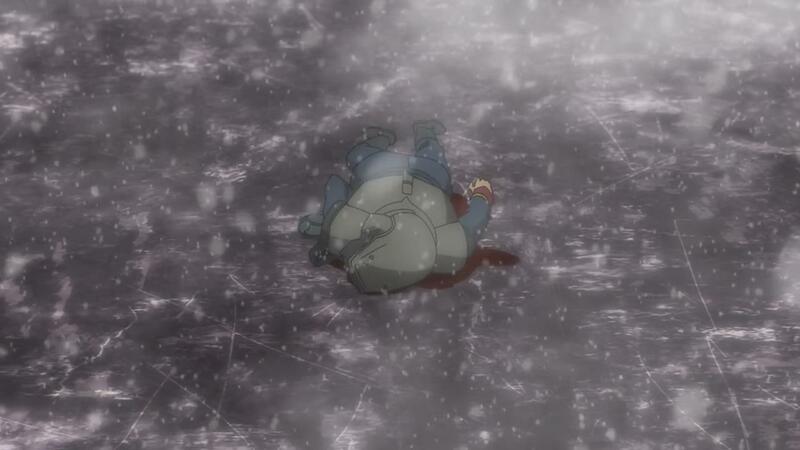 First, as you touched upon later, I’m not sure Inaho will remain dead. And I don’t trust the writers as much as you do, I bet quite often we’d have people coming out of nowhere to make “Dramatic Entrances™” to save the day. Not Inaho? Cool, how about Rayet, or the Emperor, or Marito, or even Saazbaum? The writers seem to prefer the spectacle over the well-written and developed. Secondly, you seem to be conflating two different things. You are excited to see what Slaine would do in the 2nd cour of the show. My expectations of this series are so low right now that it’s not that I am not excited to see what Slaine does in the 2nd half, but that I’m not excited for what will happen in it period. I’m likely to check it out, but mostly to be entertained by how much further they could take the ridiciulousness. 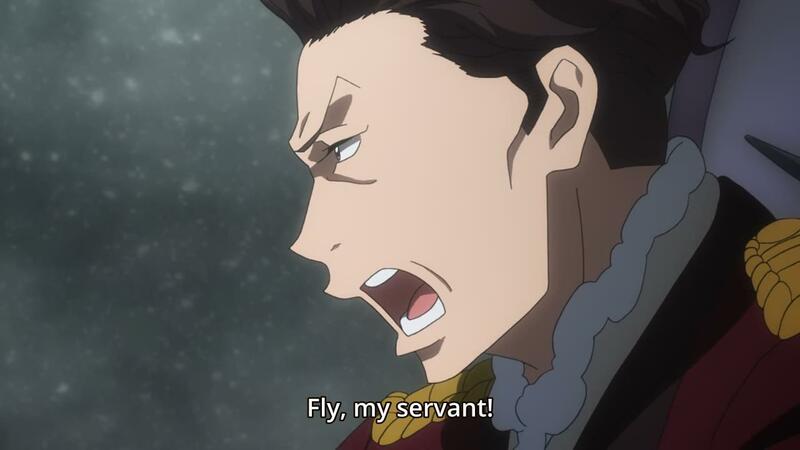 Also, Fate/Zero was written as a prequel to an established work, and to be honest, I’m not terribly impressed with Urobuchi’s “plots”, they’re definitely not the strength of his show, and this show is almost nothing but “plot”, and the padding to fill it out. Serious question, I know it’d be “cool” if he suddenly reappeared, but wouldn’t your trust in the show be shot if he just reappeared, knowing the stakes aren’t fully adhered to? Well, if they really wanted to confirm his death, perhaps they would show who fired the gun? You know, Saazbaum has the same gun model as Slaine’s. And that princess! I strongly believe she is alive. That damned necklace Slaine gave to her? That was one hell of a lucky charm. Perhaps that blocked that bullet? That anime had a great potentiality ruined by patetic characters (like Inaho) and fight scenes. Honestly the only character I did like was Slaine. And yeah, seeing Slaine killing all the bad parts of the anime in 2 minutes gives me hope for the next season. Indeed, Saazbaum wasn’t confirmed dead. I think if the first arc’s concept was “irony”, it wouldn’t surprise me for the 2nd’s to be “Redemption”, Marito’s, Rayet’s, Saazbaum’s, and Slaine’s. 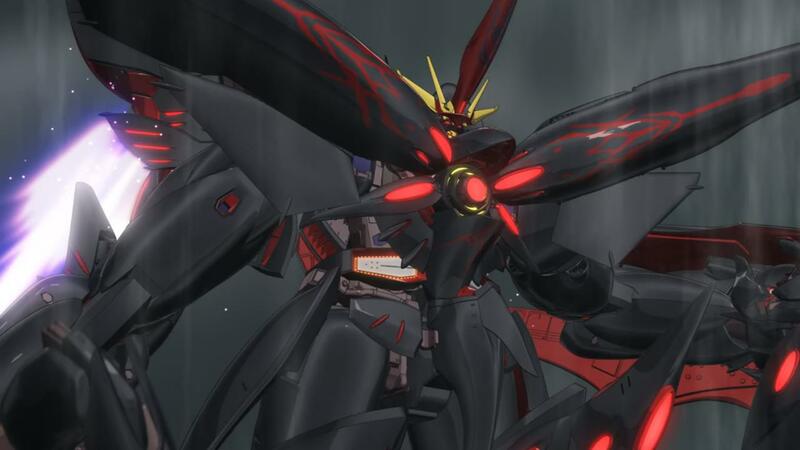 You know, Saazbaum actually reminds me of Jeremiah Gotvalt from Code Geass, in terms of design. I have a hunch that Slaine’s lineage can also activate Aldnoah Drive. PS: Seylum’s dead? Hell yeah. but Inaho’s dead? I would not like that since i didnt like story which switch the MC in the middle of story..
Well, the main problem with an MC being killed off is that you’ve spent all this time on them, and then you’re only left with underdeveloped characters, right? But this show had 3 main characters, and 1 is confirmed alive. Furthermore, think of it as a done series, and next season will be a new series, or “next generation”. But honestly, the real reason I wish Inaho would remain dead is that in spite of all of the time he’s been given, he’s still one of the least interesting and developed characters in the show, so give a chance to the others to shine. It does seem that way, also what with his father having researched the Aldnoah. But then again, maybe we’ll find out that the Aldnoah itself somehow recognized him, and his conviction, rather than something to do with “lineage”, though he does share Asseylum’s hair. In the end we’ll find out he’s a relative of hers. I can already see Slaine wearing royal clothes. He has that face and build. I fully agree with your verdict on Inaho. He just didn’t work at all and kin of undermined the whole overpowering technology advantage of the Martians. It doesn’t matter because Inaho apparently read the strategy guide and just beats all of them. It was still entertaining for me to see how he beats them, but there just isn’t any emotional investment in it. For all the screentime Inaho had, they also never bothered to actually explore his character a bit. I was always expecting some explanation as to why he is so unnaturally rational (especially for a teenager), but that never happened in the end. I still liked the series overall, but I really hope they put Inaho to rest. I suspect the bit about technology was done on purpose. I comment at times about the lack of adults in anime, or how they’re ineffectual or outright villainous. Technology here serves the same purpose – an individual could swing the fight more effectively than endless faceless technological superiority. The myth of the individual beating the odds (just think Rambo) is something most modern media pushes, and anime even more-so. I don’t mind that, I really like various shounen series that do that kind of thing all the time, it’s just the execution here. Inaho is just impossible to relate to / root for, so his victories fall flat for me. 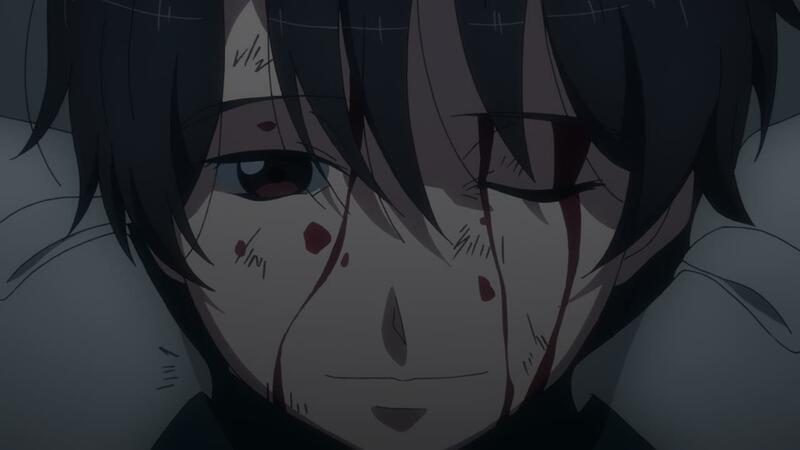 It doesn’t feel earned, there is seemingly no real hardship to overcome, Inaho just wins, because that’s what he does. There are also no other conflicts to latch onto with him. He was basically just the perfect soldier, always calm and collected, making the decisions that give him the highest probability to succeed. It just feels odd to give him that much screentime, make him this unrelatable and then never really go anywhere with it. If we go with the classical tragedy angle, I could maybe kind of see how he fits in, since he ultimately was responsible for his own demise by declaring Slaine his enemy. Either saying that his super rational actions where his fatal flaw or that he wasn’t as rational as he believed himself to be which lead to his downfall, as his feelings for the princess are shoved into our face at the end. Antagonizing Slaine earlier didn’t make too much sense to me at least, at least attempting to win him over as an ally would have been the strategically valuable option, wouldn’t it? This could very well mean something IMHO, as one of the blood descendants that can activate an aldnoah, remember it was never really shown/discuss in detail how the emperor bestows to the chosen Versian elite the right/privilege to use the aldnoah energy. This can very well be a kiss or other biological contact made with an ordinary versian with the emperor/emperors kin etc… with these also mean that the privileged to activate aldnoah by the chosen versian nobles can be passed of to their offspring as well? begs to question….. and what other effects does the aldnoah power have to ordinary Terran if ever granted access/privilege e.g. (regeneration,healing etc. )????? INAHO and Yuki’s mother could ideally be the then woman which supposedly died in Heaven’s Fall. ( if she really died then why is her Kataphrakt still intact after the explosion years later, which would mean her body would have been safe/recovered if the Kataphrakt was still in one piece , why is the ship Deucalion in that island too? hmm…. get the point? to convenient for the Terrans to create/copy the Aldnoah into Deucalion or master Kataphrakt tech if there was no source……Saazbaum fiancee….. Probably she never died, she could have suffered head trauma gets amnesia forgets everything etc…. then is a test subject for the tehrans in copying the martian Kataphrakt tech, somewhere along the way falls in love with a teran scientist or whoever (father of inaho and yuki) then boom has a family. If this theory holds out, I’m not going to be surprised if INAHO(if his still alive) or yuki in the 2nd season can activate Aldnoah. 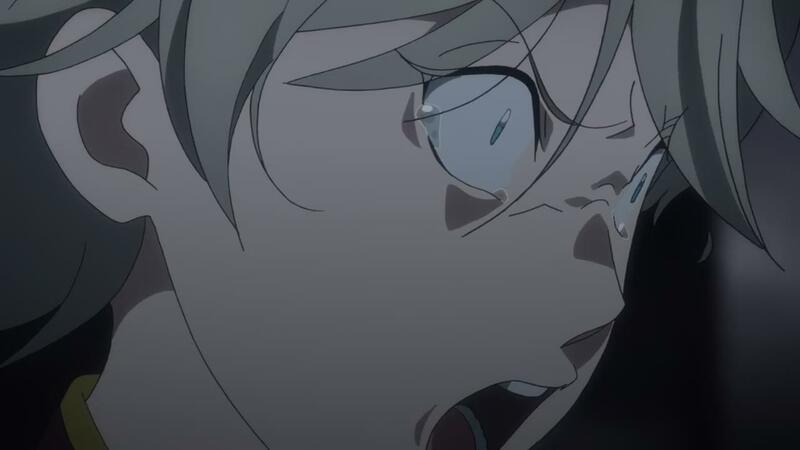 Again if biologically aldnoahs key is passable, then Seylum could have transmitted it unknowingly (via saliva) to both slaine and inaho when they kissed. AGAIN ALL ARE JUST MY CRAZY THEORIES & OPINIONS……. Wow, I like your analysis. You even included what Slaine’s feel and about his honour when most of people became hater of him now. Poor Slaine. He embodies the phenomenon of long-distance relationship with ineffective ways to contact (from Slaine to the Princess). The princess doesn’t even know or care about how Slaine strunggles in his own way to find her. I feel like Slaine now.. Being Slaine is suffering. Should focus on what we can do at the place we are now, focus on our work (like the Princess) instead of “trying to rescue” someone far away (like Slaine). Being Slaine is suffering. I don’t care if anybody is really dead or re-killed or revived.. Just hope the plot story will make a happy ending and moments with Slaine instead of showing him detestable. I hope that both the princess and Inaho are really dead, but if I had to put money on it, I’d probably guess that neither are. My hopes don’t stem from any particular dislike of either character (I just don’t care enough about Inaho or the princess in the first place to dislike them), but I almost always loathe ‘dead’ characters coming back to life. It’s cliched, it’s very rarely executed well, and at best it usually only serves to make me roll my eyes. It was obvious they wouldn’t stay dead. I expected we’d get Inaho coming at the end of an episode, as a “cliffhanger”, but they gave it all away in the promotional art. Well, in other words, “as expected”. ughmmmm isnt anyone bothered why a main char is so underdeveloped despite having most of screen time and suddenly just gets written off in the end? doesn’t that seem suspicious,(or just me having finished so much mystery animes recently), Anyways its been a long time since i felt the “oh,okay?” after watching an anime. and to the bringing back to life of the princess and inaho…..